Dry brush paint projects are almost too easy. This technique is a great way to add depth and texture to your paint project. And you can do it. A 5 year old can do this. The secret to the technique? Quick and light brush strokes using a very dry paint brush. The end result? A perfectly imperfect paint finish that fits many styles or themes. Dry brushed décor can look beachy, rustic, weathered, farmhouse, etc. . Once you dry brush paint you’ll wonder why you haven’t tried the technique before. I know you guys have seen my dry brush paint projects before but just in case I’m including my favorites in this list plus a few more that have me thinking of future projects. Coral Painted Dry Brushed White Cane Back Chair. 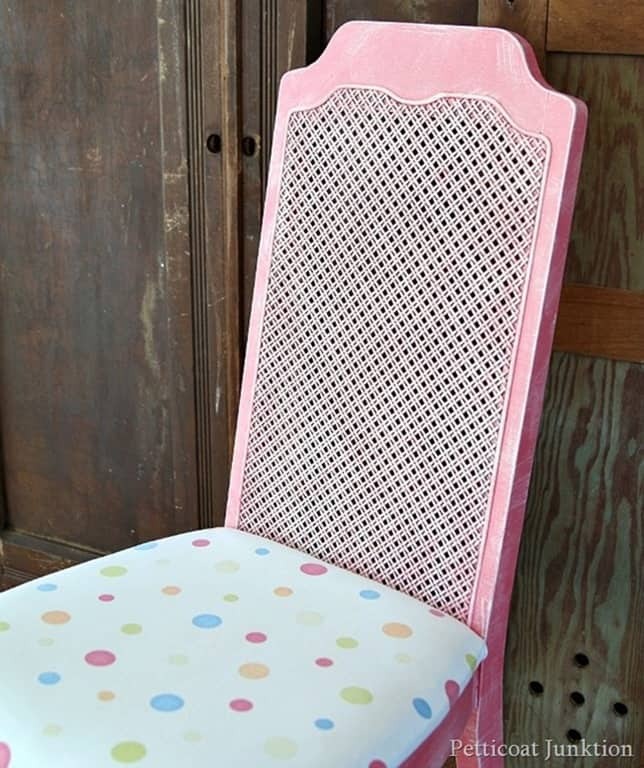 This project of mine included coral paint and a pretty polka dot pillowcase with lace trim. Very Girly. DIY Headband Organizer. I love this project because it’s a complete DIY. From start to finish, you can build the organizer and then it shows a really fun and unique way to dry brush the focal point. Dry brushing doesn’t always have to be all over the entire piece to make it effective and eye-catching. DIY Rustic Pumpkin Stand. Fall will be here before you know it and it’s a good time to start thinking about those Fall projects. This fun fall project is a pumpkin stand. You can dry brush anything. It doesn’t have to be furniture. Beach Sign Knock Off. Perfectly beachy……and easy. Bookcase Makeover. Fun story and curbside finding adventure. Shows how adding just the right detail adds up big time. DIY Dog Bowl Holder. I know I have a lot of dog loving readers. Your four-legged friend will love this simple dog bowl holder. Driftwood Finish Outdoor Chair. Uh-La-La. This makeover is truly designer worthy. 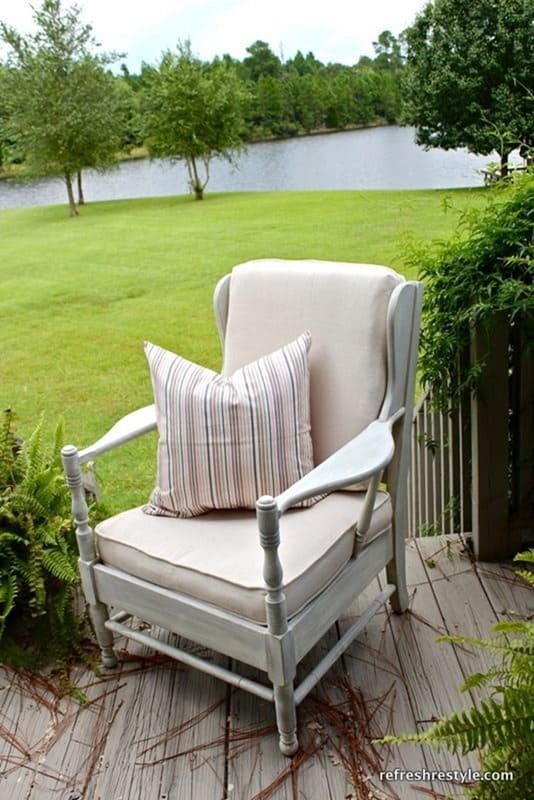 The chair had good bones and the weathered finish is so pretty. Chevron Wood Table Top with Distressed Painted Finish. Talk about time and commitment. The chevron table is awe inspiring. This project shows the “true” side of how sometimes our projects don’t always work out quite as easily as we envisioned. DIY-Spray Paint Glass Decanters for Home Decor. Glass decanters are always great for a recycle project. I choose two colors and painted an assortment of decanters. But the paint was just blah. Dry brushed paint to the rescue.This video I made shows the dry brush process really well……. Table and Dry Brush Chairs. I really like how this project turned out. The fun part is that the table is painted one way and the chairs are actually dry brushed and yet they go together so well! Coastal Cottage End Table Makeover. The two-tone paint colors are the perfect combination to fit the style of Christy’s living room. The bottom portion of the table is painted solid, while the top is a different color and dry brushed. DIY Wooden Chandelier Light Fixture. The small wood chandelier is too sweet for words. I wish I had Corey’s wood working skills. If you are looking for a DIY project that will truly be the focal point of any room, this is the one for you. DIY Rustic Wedding Signs. Easy, easy project here. Step by step tutorial can be used to make signs for picnics, family reunions……not just wedding signs. 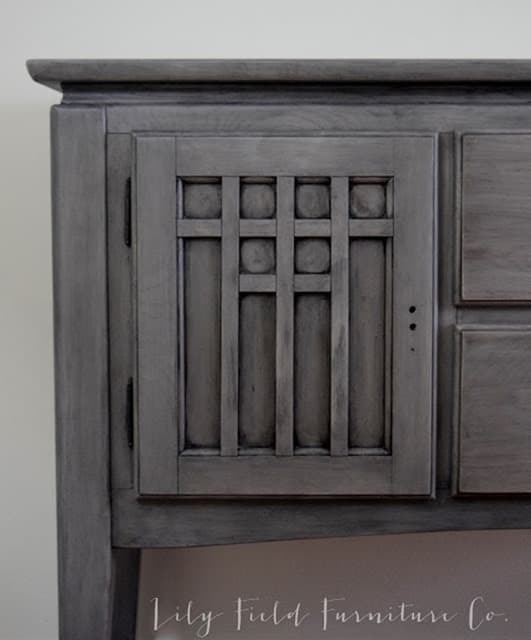 Restoration Hardware Inspired Buffet. From start to finish, the transformation of this piece is absolutely amazing. I’m in love with the gray paint. High-End furniture alert. I’m Feeling Aqua Blue. I painted and dry-brushed a whole ton of projects right here. I like painting in bulk when using the same paint color. 15 awesome dry brush paint projects…..some easy…..some not as easy……..some not easy at all, but worth the effort. Do you feel inspired? Which project was calling your name? Kathy, have you tried using hot glue to make a mold for the broken trim? You lightly oil an area similar to what you need. Add layers of hot glue. Cool, carefully peel it up. Use spackle to fill, then glue in place. The hot glue is pretty flexible and does ok! I got 2 sliver beveled mirrors last weekend at a garage sale for 5 dollars each. The frames had a lot of detail but the corners were imperfect. I dry brushed the frames with white paint, to tone down the silver and to cover-up the broken pieces. They look great! I have already sold one in my booth for 24 dollars. Pretty good for about 5 minutes of painting. I love the dry brush effect!